Denzil Pereira and Trisca Fernandes form the well-known musical duo, DnT. They come from unlikely educational backgrounds, so far removed from the world of melody that it is quite surprising that they have anything to do with music at all. Trisca has a B.Sc. in Home Science (food and nutrition) and a post graduate degree in Educational Psychology. She has worked as a co-ordinator for an HIV based project in Chimbel. Later she was part of Sangath as a research officer dealing with adolescent behaviour. Trisca has also worked as a sexuality trainer besides engaging dyslexic children and children with ADHD in constructive activity. Denzil has completed courses in Hotel Management and the Merchant Navy but he concedes that this was the solitary alternative offered up to him by the prevailing social environment. Family pressure made it difficult to cultivate his innate love of music. However, the magnetic hold that melody had on him took him full circle right back to his passion. Encouraged by his mentors at the educational institutions, he sought his own way in the music industry. Voice of Goa finalist, Trisca, remembers singing at a very tender age, entertaining visitors at age three. She reminisces about her impromptu renditions which could go on and on but would in no way bore her audience. This genetically gifted singer had her confidence boosted through the various competitions she participated in and won. Her vocal skills were further honed by the nuns of St. Joseph Convent, Aquem, where she resided as a boarder for a time. Training as part of a choir in school as well as later instruction in Indian classical music under Ramrao Naik at the Kalangan music school in Margao, conditioned Trisca’s strong voice to reach its acme. She regrets not having completed the four years of classical training she took up in 2003. After finishing four examinations she had to discontinue it owing to the approaching birth of her child. With three more years to go, she hopes to pick up where she left off at some point of her frenetically rising career. Denzil met Trisca halfway, moving from Delhi to Calcutta and coming back to Goa, a state he considers to be the hub of artistic endeavours. He departed as a member of The Big City Band to form DnT ( Denzil and Trisca). 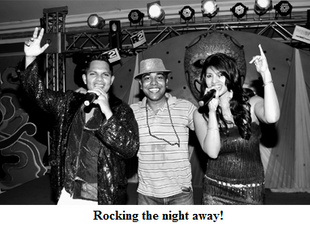 It has been a journey of five years since they started their first gig as a duo at Zuri Whitesands in Varca. Today they play at corporate occasions and weddings that have enabled them to traverse the length and breadth of India. These functions have allowed them trips to Dubai, Bangkok and Kuwait as well. Trisca laughs as she says, ‘We perform for Indians abroad too. Mostly Punjabis, Gujaratis and Sindhis. They literally throw money at us at these functions.’ They have regular shows at Taj Exotica, Casino Royale, Zuri Whitesands and Deltin Royale, which Trisca says is a boon to her bad memory because it helps her remember songs she could very possibly forget. The duo are not restricted to Bollywood songs but include in their repertoire many different genres of music. They also sing in English, Marathi, Konkani, Russian and Spanish. They credit their respective families for enabling them maintain a balance between family life and career. Despite the late nights and the myriad engagements that take them away from home and hearth they seem to be blessed with peaceful domesticity. Trisca lauds her husband, Aurvile Rodrigues and her ‘super’ mother-in-law who helps out with her two girls. She constantly calls home even when she is away to supervise the kids. Denzil too is thankful for strong family support. Denzil brings an edge to DnT with his gift of writing lyrics something that he says comes to him effortlessly. Trisca naturally provides him with feedback as to the quality of the lyrics. DnT will be releasing a single with Konkani and English lyrics. The song has a modern beat and is directed at people who frequent clubs. This is their way of doing something to raise the status of Konkani at the national level according to Trisca. ‘It helps if a song becomes a hit in the clubs,’ she says. Individually too, they have been soaring high in their careers. Trisca has lent her voice to songs from Joywin Fernandes’ Konkani films ‘Friends’ and ‘MMS-A Violent Love Story’. While Denzil has penned a song with Konkani and Hindi lyrics entitled ‘Jivit Tu Mojen Saar’, for a Bollywood film Living on the Edge. The song will be sung by Sherrin Varghese of Band of Boys.